View More In Outdoor & Recreational Areas. A beautiful, colorful guide to bringing the style of Nantucket Island to your home. There is something essentially charming about a simple cottage surrounded by a fence covered with roses. More than 1,200 of these houses can be found on Nantucket Island. Nowhere in this country are there more charming and diverse cottages featuring small pocket gardens and window boxes than on Nantucket. To a large extent, the character of the island is reflective of these little early homes. They were originally built by and for island residents at a time when islanders didn’t require, didn’t desire, or couldn’t afford anything larger. Living small, as typified by cottage living, has become the responsible, chic, innovative, and practical wave of the immediate future. Many homeowners are rethinking their needs in regard to space, opting for more quality and less quantity of space. They know that a house is more than square footage, and a small home is one that can be infused with special details and designed to accommodate the lifestyle of its occupants. Neither size nor volume has anything to do with style and comfort. The homes and gardens featured in Nantucket Cottages and Gardens reflect classic design elements that have been embraced in the past and continue to survive in the present. 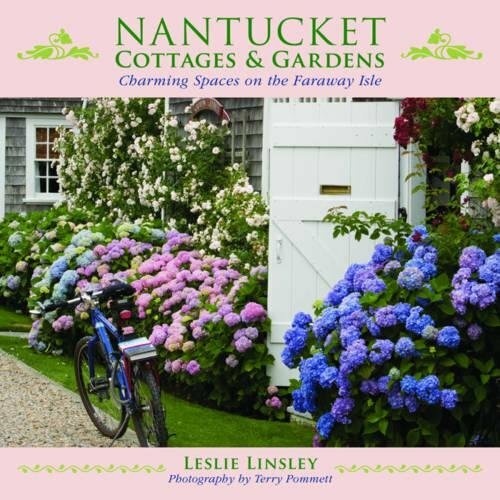 Throughout this book, the cottages of Nantucket will inspire those who are building new, renovating, or decorating a small home. When the quantity of space is pared down, more money can be spent on the things that give a house character, such as built-ins, weathered wood furniture, unique art pieces, and handmade textiles, to name a few.